You guessed it right! Person B enjoyed eating sushi in a healthy way! Not only did that person eat less but also benefited from the nutrients found in salmon and tuna such as omega-3 and omega-6 that are of an extreme importance to an overall good health! Eating too many maki rolls has never been and will never be an optimal solution to enjoy the healthy side of sushi!On the contrary one could easily fall in the trap of overeating and consuming many unwanted calories coming from rice, mayonnaise, “crispy”(that is by the way deep fried) and getting little or no benefits! 1)Whether you’re having sushi for lunch or dinner, always start with a bowl of edamame to share! Eh-da-ma-me is the Japanese word for branched beans! They are a source of complete proteins which would naturally make you feel satiated and would help you avoid ordering a lot of maki rolls! 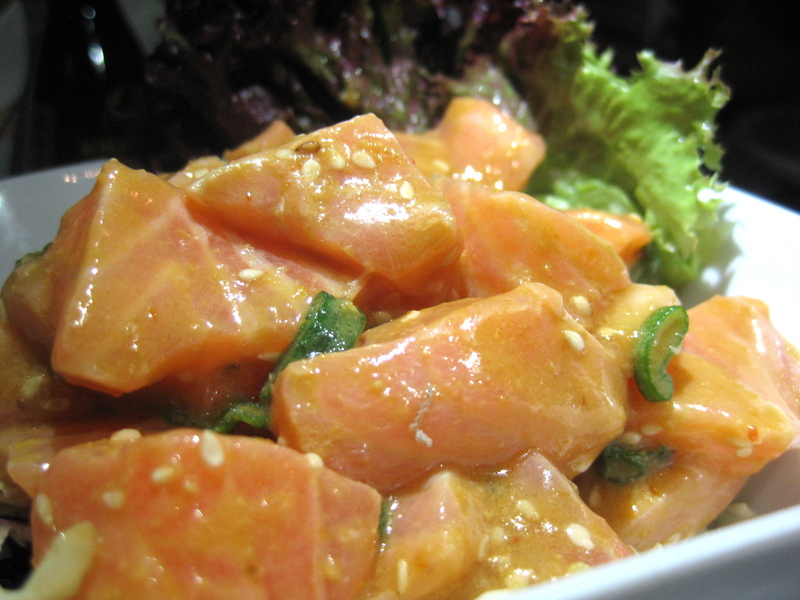 They are also low in fat and rich in antioxidants and phytochemicals. Phyto means plant in Greek and Chemicals are the plant’s chemicals that help the plant fight off the wind, the sun rays, the rain and protect itself against them all!Once ingested those phytochemicals also help our body fight off all free radicals and any type of disease! Thus strengthening our immune system and reducing the risk of cancer and other diseases! 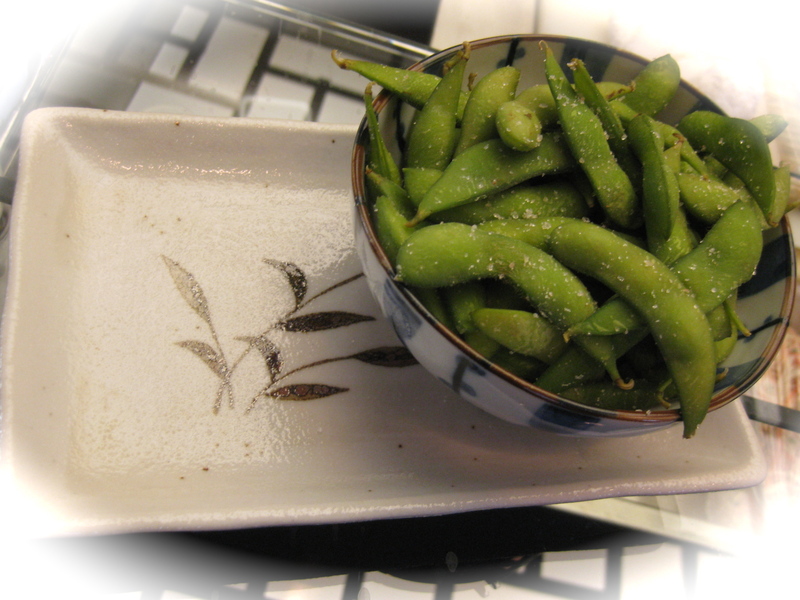 1/2 a cup of edamame has 11g of proteins, vitamin C, vitamin B,vitamin E, minerals and 4g of fiber! If you suffer from constipation you need to increase your fiber daily intake and normal individuals need to maintain an intake of 25-30g/day.Make sure to include edamame in your daily diet plan! 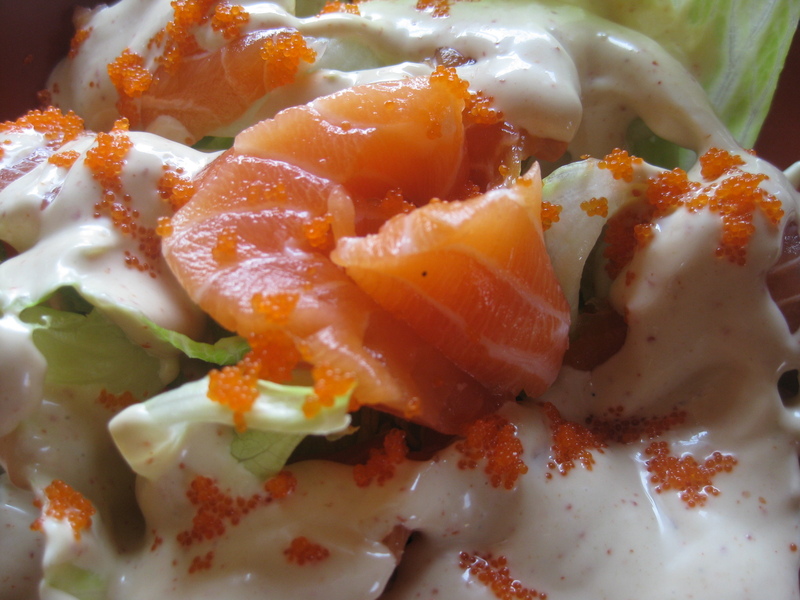 2)Make sure to include a salad whether it’d be a salmon salad or a crab salad WITHOUT MAYONNAISE! 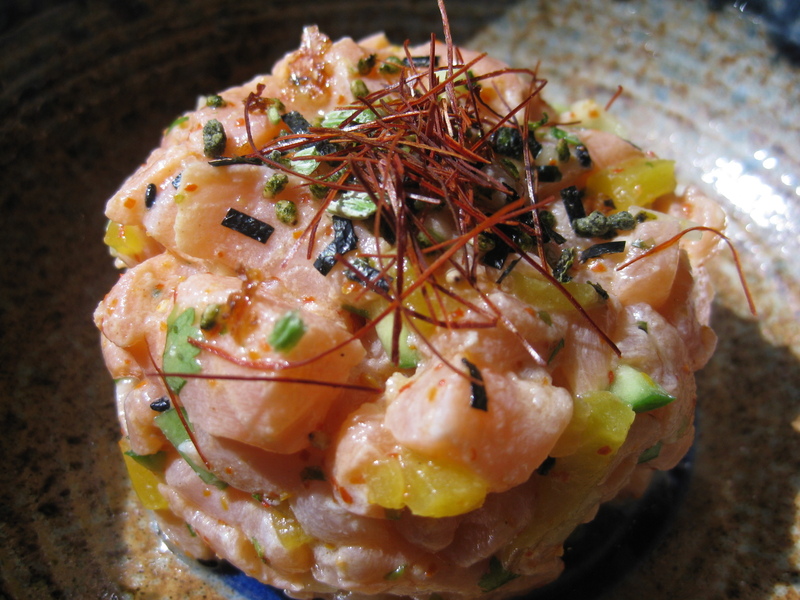 !Or go for a salmon tartare! 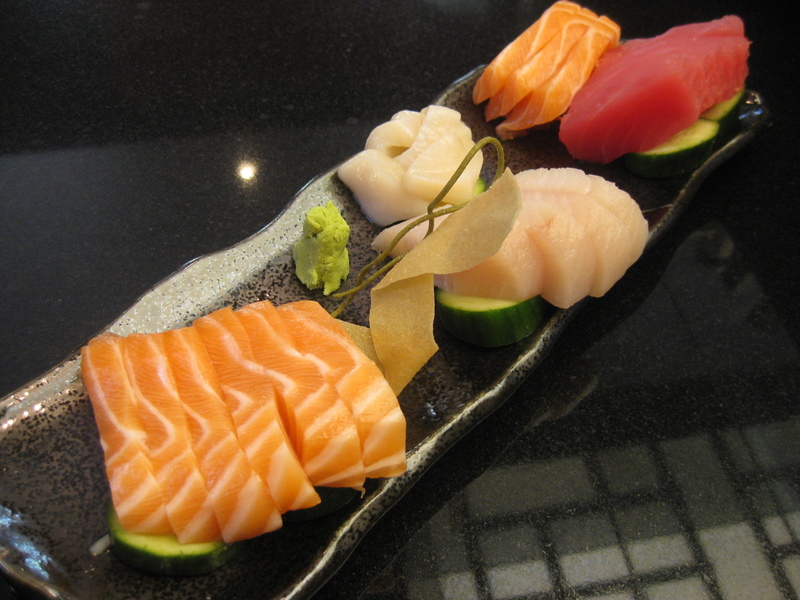 3)While placing your sushi and sashimi order make sure to always have a ratio of sashimi>maki rolls! 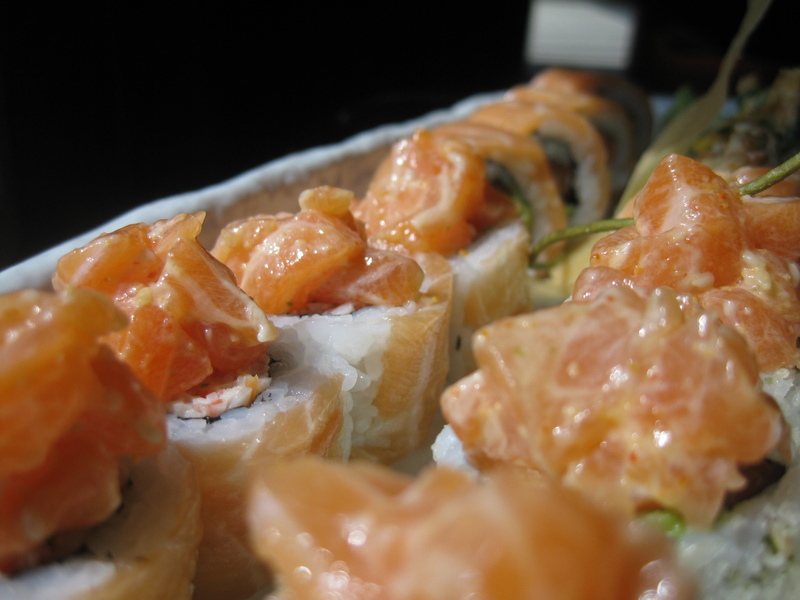 4)Leave little or no space for maki rolls! Can you spot the mayonnaise in the picture above?? If you can leave a comment below! What’s your favorite sushi place in town ? Your opinion counts’ leave your answer below! ← ~But sushi isn’t fattening…No?! !